Transform your extended stay into a relaxing getaway at TownePlace Suites Dallas DFW Airport North/Grapevine. Start your day off with a complimentary morning buffet, featuring a variety of American breakfast classics such as bacon, eggs and sausage. Experience our hotel's unparalleled access to several of the area's most popular destinations including the Grapevine Mills Mall, Dallas/Fort Worth International Airport, Bass Pro Shops and LEGOLAND Discovery Center Dallas/Fort Worth. At the conclusion of your eventful day of business or adventure, retreat to comfort in our spacious suites, providing fully equipped kitchens, free Wi-Fi and flat-panel TVs. Whether taking a dip in our zero-entry outdoor pool or going for a run in our 24-hour fitness center, featuring free weights and cardio equipment, our amenities ensure your workout doesn't have to go on vacation when you do. 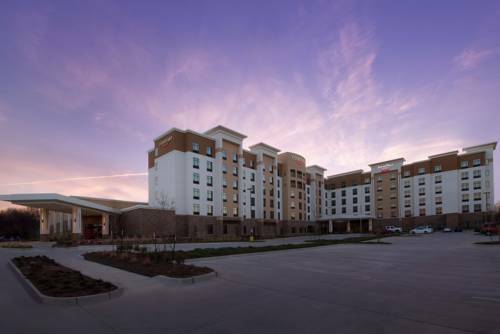 Whatever the reason for your Texas stay, make it memorable at TownePlace Suites Dallas DFW Airport North/Grapevine.